Circa 1957. "IBM Manufacturing and Administrative Center, Rochester, Minnesota. Cafeteria. Eero Saarinen, architect." 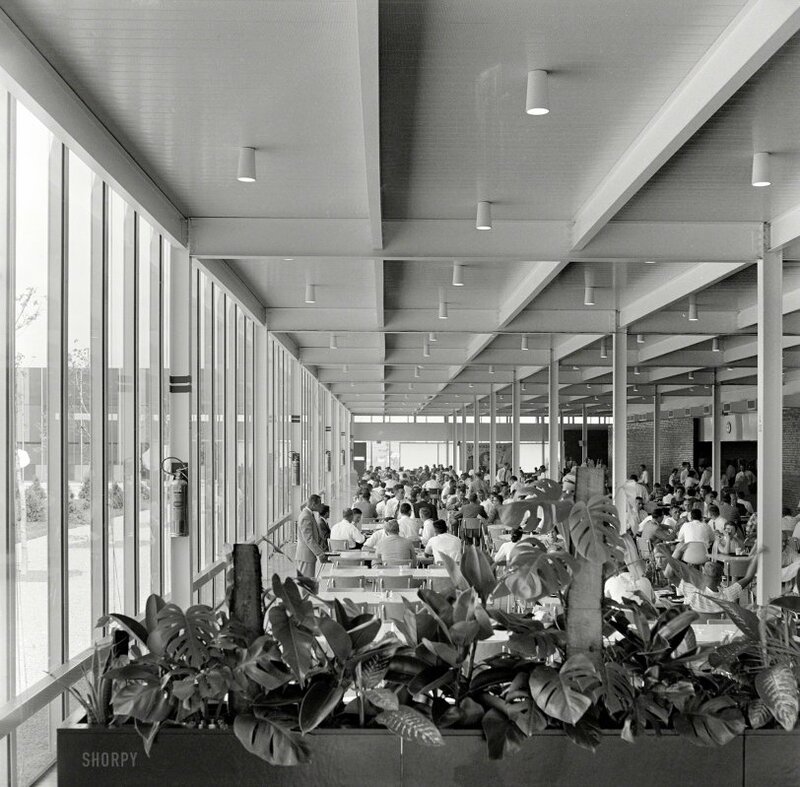 Medium format negative by Balthazar Korab. View full size. Submitted by pvallen on Thu, 08/07/2014 - 11:14am. The floor to ceiling windows in this photo were just replaced this summer (2014) with a new set of energy efficient windows. Still floor to ceiling. Fire extinguishers are gone. "Best practice" now in case of fire is to exit the building and leaving the fire fighting to the pros. Ashtrays are gone. The site has been smoke free for many years now. People still dumb enough to smoke have to stand out by the parking lot in the 20-degree below zero winters. Mentioned in the photo caption, Eero Saarinen is now considered one of the masters of mid-20th century American architecture. He designed campuses for several large corporations. His most famous work was probably the "Gateway Arch" in St. Louis. The IBM campus in Rochester, MN shown here is a grid of many low buildings (at most two stories above ground level). It was IBM's first US facility built outside of the Northeast US. With more square footage than the Empire State Building and roughly half the size of the Pentagon, this facility has, for decades, been IBM's largest facility under one roof. Submitted by Mudhooks on Fri, 11/08/2013 - 10:06pm. It is likely that there are several men of colour in the photo. There were many Indian, especially Parsi, electrical and computer engineers working at IBM and other major companies. Students from India were studying engineering and in other technical fields at MIT as early as the late 1800s. Historian Ross Bassett of North Carolina State University has been documenting the history of Indian engineers who studied at MIT and the Indian Institute of Technology and who became engineers at IBM and other companies. He is working on a bio of my step-father, Soli Dubash, (amongst others) who studied engineering at MIT before and after WWII and went on to work on many prominent architectural projects across Canada, achieving the position of Chief Engineer at the Department of Public Works, here in Ottawa. Submitted by Mudhooks on Fri, 11/08/2013 - 9:46pm. The ubiquitous cut-leaf philodendron of the 1950s and early 1960s are rarely seen in homes or businesses. Then it was the most popular indoor plant. It was very attractive, practically kill-proof, didn't leave dead leaves all over and was relatively easy to trim or let go wild, depending on your taste. We had one from about 1958 until the mid-1970s that survived three moves and a fair bit if neglect and/or overwatering. It finally died after one of our cats took to "watering" it himself. Submitted by UpNorthBob on Tue, 11/05/2013 - 8:39am. That picture reminds me so much of my high school cafeteria, which was built in 1956-57. If that building is still standing, I wonder how many of those windows remain. Most other buildings I've seen have replaced most of their windows with solid walls. Submitted by lindab on Mon, 11/04/2013 - 2:43pm. My dad was a field engineer for IBM from 1952 to 1987. Into the 1970s, he would come home from work with grease on his white shirts from fixing computers and printers. I got to play "office lady" with discarded punch cards, and he still has a box of old paper from a daisy-wheel printer that he doesn't want to throw away! Smoke 'em if you got em. Submitted by BILLY_YANK on Mon, 11/04/2013 - 2:09pm. Ashtrays on every table, fire extinguisher on every pole. Submitted by VictrolaJazz on Mon, 11/04/2013 - 11:26am. First of all, I don't see anything that would burn in that cold, anuglar room. It's about as unwelcoming as a place could be what with its "I" beams everywhere, bland light fixtures and the plants, if they are real, don't even provide any relief. A perfect set right out of "The Organization Man" or "The Man in the Gray Flannel Suit" and I'm sure Atlas would have shrugged in this year of his birth. Submitted by Queenie on Mon, 11/04/2013 - 11:18am. My uncle worked for IBM in the early 60's in NYC. He had a wardrobe full of white shirts as that was all they were permitted to wear if they dealt with the public. I'm thinking the striped shirt and plaid shirt guys were visitors or only worked internally? Submitted by BBanzai on Sun, 11/03/2013 - 6:42pm. Apparently, only tall people are supposed to fight fires. Submitted by GregTT on Sun, 11/03/2013 - 1:21pm.